Welcome back, professor Ratzinger. Benedict’s legacy What will the next Pope be like? Benedict XVI will be like a Moses for the Church. Moses went to a mountain and interceded for the People of Israel while the latter were combating against Amalek. So will the Pope do after his retirement – the President of Pontifical Council for Culture, Card. Gianfranco Ravasi, said in a Lent meditation held for the Roman Curia. For a whole week, three times a day, the Pope and the Roman Curia gather at the Redemptoris Mater chapel, on the second loggia (floor) of the Apostolic Palace, for the spiritual retreat. The morning meditations conclude at eleven, allowing Benedict XVI plenty of time to meet with his personal secretary (and Prefect of the Pontifical Household) Georg Gaeswein, to address everyday affairs. Some maintain that Benedict XVI’s pontificate has in effect come to an end, and that everything is to be put on hold. Benedict XVI does not think so. There is no need to accelerate the handling of daily affairs, but they do not come to a halt either. Everything must go on, at normal speed. Appointments for different positions are made as usual, with no exceptions. No matter if there are controversies, if every appointment is exploited and used as an excuse to feed resentments and stir feuds, or to attack the Church. The Church must go on, beyond all of this. So, this last week, during the Lent Spiritual Retreat, two appointments were published. Scandalous, some cried out. In fact, these appointments had been decided a long time ago. The first appointment is that of the new president of the Religious Works Institute (IOR) Council of Superintendence. Ernst von Freyberg, of the Order of Malta, is a business lawyer with remarkable experience in finance. Meanwhile, nearly all of the IOR Cardinal Commission members will stay on. The second appointment is that of Ettore Balestrero, currently the Vatican’s «Vice Minister for Foreign Affairs», as apostolic nuncio to Colombia, in order to strengthen the Church in Latin America. The IOR – a sort of Vatican trust fund – had been nine months without a president. Since the Council of Superintendence voted to pass a no confidence motion on the former president, Ettore Gotti Tedeschi, the IOR «board of laymen» had been headed by its vice president, Rolando Schmitz. The latter recommended to use Spencer & Stuart – a specialized «headhunter» agency – to look for candidates for a new president. Since July, specialists from this Frankfurter agency had been visiting the Vatican to gather information about the role of IOR president of the board, and the ideal profile of the next office holder. Spencer & Stuart first identified about 40 candidates, then selected six who were personally interviewed by the Council of Superintendence. There were three finalists, who were interviewed by both the board of laymen and the board of cardinals. Finally, the German Ernst von Freyberg was chosen. His managerial experience was not his only qualification. Yet, it is worth noting that he is cofounder and managing director of Dc Advisory Partners. Formerly he had been an analyst at Three Cities Research, and president of Blohm+Voss, a naval industry. Von Freyberg was also chosen for his catholic credentials. He is an active member of the Order of Malta, a promoter of pilgrimages to Lourdes, and a nobleman. His appointment seemingly signals a return to an ancient practice: the Vatican puts its trust once again on a highly qualified personality from a Catholic and noble family, whose loyalty to the institution is independent from, and goes beyond, job-related contractual obligations. 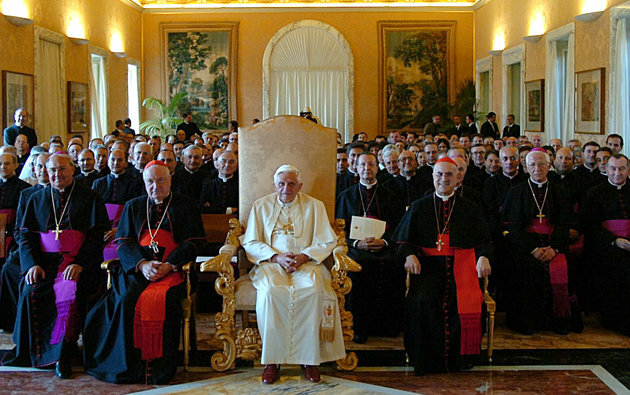 The mandate of the IOR Cardinal Commission for Oversight, and of the new board, will expire in 2017. Card. Tarcisio Bertone is still the president of the Commission, since he is Secretary of State (he will be replaced when a new Secretary of State is appointed). The appointments of cardinals Scherer (Brazilian), Toppo, (Indian), and Tauran (French) have been confirmed. Card. Nicora, on the other hand, has left the commission because he was also president of the Authority for Financial Information, which could have lead to a conflict of interest. Nicora had joined the board as the then president of the APSA (the Vatican «central bank»). He is replaced by his successor as APSA President, Card. Domenico Calcagno. Choosing a new IOR president was a process which began a long time ago, before Benedict XVI announced his decision to resign from the Petrine ministry. So was the process leading to the appointment of Ettore Balestrero, Undersecretary for Relations with States, as apostolic nuncio to Colombia. During the past few years, Balestrero has worked to advance the Holy See’s path toward full financial transparency: he led the Holy See delegation at the plenary assembly of MONEYVAL – the body of the Council of Europe that evaluates the adherence of its member states to international standards – and he briefed journalists about the findings of the MONEYVAL report. Ettore Balestrero’s work went beyond, certainly: working as Undersecretary for Relations with States, he worked on the negotiations with the state of Israel and opened up Vietnam – where soon there will be a Holy See resident representative. Before that, he had worked in Korea and the Netherlands, and at the Vatican Secretariat of State, where his portfolio included relations with the Organization for Security and Cooperation in Europe (OSCE). His main interests have always been peace, integral disarmament and religious freedom: he was among the organizers of the first conference ever held on intolerance and discrimination against Christians. While at the Secretariat of State, he also participated in the meeting organized by the Pontifical Council for Justice and Peace with non-institutional military chaplains. In that occasion, the Colombian military chaplain was present. Was it a sign of what the future held? Certainly this background was taken into account when Balestrero was chosen to be apostolic nuncio in Colombia. 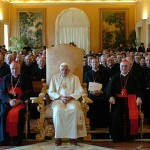 The challenges he will face are those outlined by Benedict XVI in 2012. The Pope met Colombian bishops during their ad limina visit, and asked them to strengthen catechesis and relations with other Christian confessions. But he also underlined that bishops should not forget those «compelled to emigrate from their homeland» or those «harmed in their fundamental rights» or «forced to abandon their homes or families under the threat of the obscure hand of terror or of criminality», or still «those who have fallen in the nefarious networks of trade in arms and drugs. » The Catholic Church looks at Colombia with much interest: it has 102 bishops and a lively Church, so much so that there was talk of a papal apostolic visit. This project did not come to fruition with Benedict XVI, but may very well happen with his successor. Balestrero’s appointment had been announced together with that of the new apostolic nuncio to El Salvador (Msgr. Leòn Kalenga) and that of the apostolic nuncio to Liberia (Miroslaw Adamczyk), the latter on his very first postings as “Pope’s ambassadors”. All of these appointments come at the end of a cursus honorum of about 15 years. Balestrero’s appointment, ultimately, has a precise goal: to strengthen the Church in Latin America. That is why Balestrero’s predecessor in the Secretariat of State, Pietro Parolin, was assigned apostolic nuncio to Venezuela, and its former head of protocol, Fortunatus Nwachukwu, was appointed Papal nuncio to Nicaragua.